No need to rent a car, take a taxi or walk a mile to enjoy the many activities that are just outside the front door of the Lovango Beach House. A few steps to the beach or on to the dock opens a world of water activities and relaxation. There are coral reefs surrounding Lovango Cay that are teeming with marine life from small exotic reef fish to trophy size tarpon. 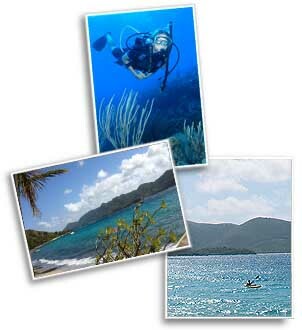 Snorkeling and diving the crystal clear water of these reefs is an unforgettable adventure. Fish off the lighted dock day or night and maybe that trophy fish awaits you. Lay in the sun, walk the beach hunting shells and sea glass, kayak, jump off the dock, just laze in the shade of the thatched beach hut and listen to the waves or choose one of the hammocks and settle in with a good book. Whatever activity you choose to do, Lovango Beach House offers an incredible place to do it!